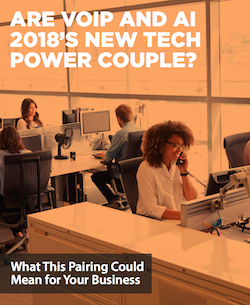 Are VoIP and AI 2018's New Tech Power Couple? Whether you like it or not, AI is going to be hugely disruptive across many facets of business over the next decade. According to Constellation Research, the Artificial Intelligence (AI) market will surpass $100 billion by 2025! But the changes aren’t just in the future - AI is going to start shaking things up in 2018 as well. Read our latest guide to learn more about AI - along with a detailed exploration of the potential benefits that VoIP systems stand to gain from it.